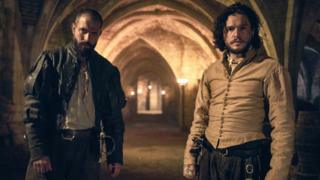 A BBC drama about the gunpowder plot has drawn criticism for its violence. One viewer labelled an execution scene in Gunpowder "grotesque and completely unnecessary", while another called it "one of the most painful things I've ever witnessed on TV". The drama, starring Game of Thrones' Kit Harington, tells of the 1605 plot to blow up the Houses of Parliament. The BBC said the offending scenes were "grounded in historical fact" and reflected what took place at the time. The first episode, shown on Saturday, showed a woman being pressed to death and a priest being disembowelled. "I'd been really looking forward to #Gunpowder but just had to turn off during the first episode," tweeted one viewer. But another Twitter user said the drama had to be "graphic & gory... for us to understand the depth of persecution, and why [Robert] Catesby & co did what they did". The drama began at 21:10 BST, just after the watershed, and was preceded by a warning. In a statement, the BBC said: "The scenes aired after 9.30pm with a clear warning given to viewers before the episode started. The methods depicted are grounded in historical fact and reflect what took place during the time of the gunpowder plot." Broadcasting watchdog Ofcom said it had received seven complaints. The corporation would not confirm how many direct complaints it had received. In an interview with Radio 1 Newsbeat, Harington - who plays his ancestor Robert Catesby in the three-part drama - said the violence was justified by the context. "It was important for the story because right from the start we need to know why Catesby embarks upon this very, very violent act," the actor said. Was Guy Fawkes a fall guy?